Bathroom storage solutions are more customized and functional than ever. The desire for more storage, technology and luxury in the bathroom has resulted in a new design aesthetic that offers a high level of customization, convenience and utility. “Homeowners have moved past plated glass mirrors that cover the entire wall, “ observes Amy Launius, Showroom Manager of Premier Plumbing Studio. Mirrors, lights and shelves now can be configured into almost unlimited arrangements that suit a variety of functional requirements and style preferences. Function: New developments in space utilization and efficiency have significantly upgraded the functionality of bathroom design. • Small shelves and racks hold hard-to-store eyewear, razors, contact-lens cases and cosmetics. • Shelf-mounted magnetic strips allow users to keep track of small items like tweezers and nail clippers. • Automatic interior lights turn on when the door is opened and off when closed. • Cabinet-mounted magnifying mirrors extend on swinging arms at adjustable heights to cater to multiple users. • Vertically opening cabinet doors are optimal for small spaces and some feature shock absorbers that facilitate opening. • Locking cabinets store prescription medicines, razors and other potentially harmful materials away from children and guests. Technology: Today’s innovative technology inspires an approach to home design that responds to the demand for uninterrupted access to information and data and the need to power and charge power multiple electrical and wireless devices. • Mirror-integrated TVs offer a high-tech option for news and entertainment. 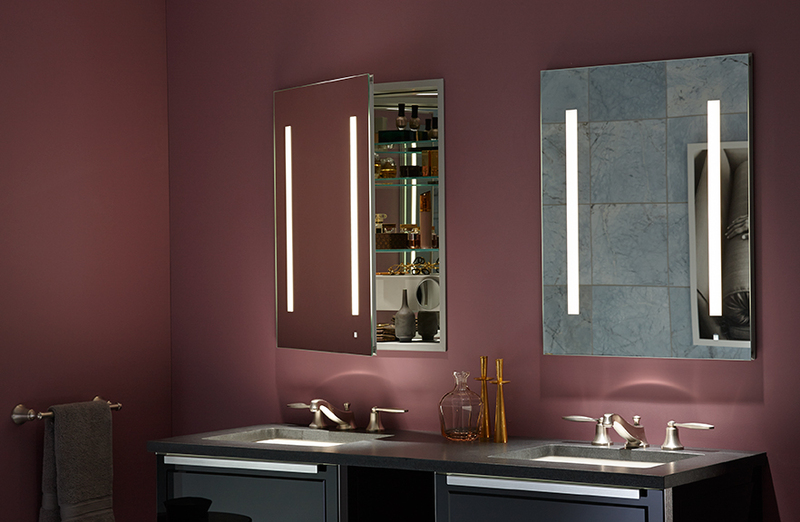 • Mirror-integrated LED lighting provides seamless and energy-efficient illumination. • Outlets mounted to cabinet interiors power frequently used corded items such as hair dryers, curling and flat irons, electric toothbrushes and electric razors at a convenient height. • USB ports charge mobile devices. • A timer-enabled electronic defogger eliminates steamy mirrors. • A refrigerator installed directly in the medicine cabinet keeps temperature-sensitive medications and products with a short shelf life cold, while also keeping beverages on hand. Whether you are working with a small space, upgrading your home’s gadget capacity or creating a relaxing retreat, there is an exciting abundance of options available for a personalized solution.